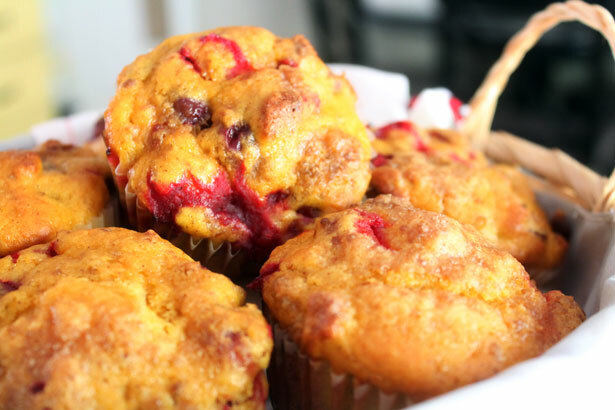 Butternut Squash Muffins made tangy with fresh cranberries. They’re great for breakfast, or afternoon tea! I have to say that butternut squash muffins aren’t something that ever occurred to me before. But, faced with one from our weekly CSA that sat on the counter for at least two more, I knew something had to happen. Most people would immediately think soup, but I’m a weirdo. Pureed soups, unless they’re tomato, don’t always sit well with me. While pregnant? Nuh-uh. Not happening. I decided I’d start by simply roasting the butternut squash. I mean, anything can be made from roasting a vegetable. Soups, a side dish, even a puree. I must admit, making butternut squash puree was about a thousand times easier than making pumpkin puree, and the flavors are very similar. Don’t get me wrong – I adore pumpkin in all its many forms. 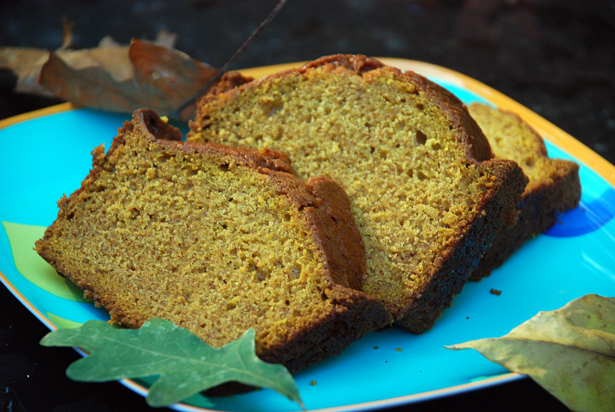 This pumpkin bread recipe? Rocks my socks every season. But pumpkins always seem a lot more intimidating than a li’l ol’ butternut squash. Especially since you can peel the skin with a vegetable peeler, and chopping the squash is simple from there. 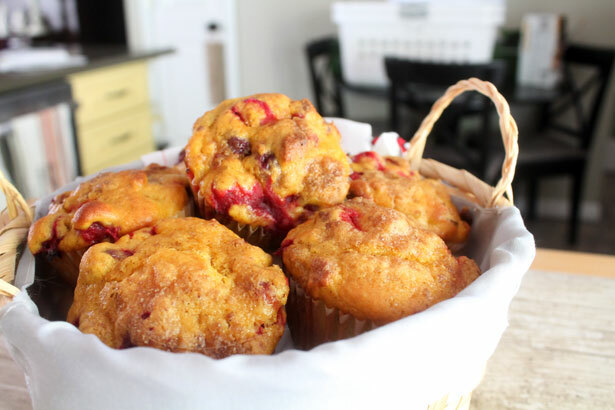 Tart cranberries are the perfect addition to these muffins. Butternut squash is sweet and earthy, and it needs a counter-balance. You could add some lemon zest and skip the cranberries, but why would you do that? 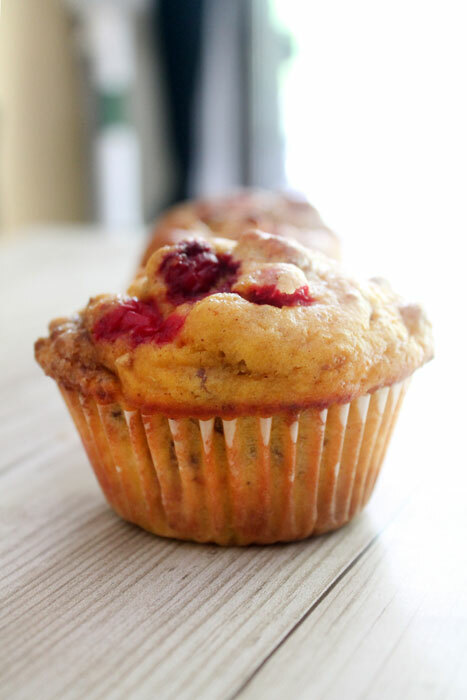 Baking fresh cranberries in anything transforms them into beautiful bursts of tangy, juicy flavor. You could use dry cranberries instead, but if you can get your paws on some fresh cranberries, don’t skip them. Lastly I added toasted pecans, because, yeah.. Texan. If a pecan can go in a baked good, I’m going to do my best to shove it in there. I love the contrast in texture they provide, as well as the additional nutty tones that complement the butternut squash. But you don’t have to add nuts unless you want to. You could also toss in some sunflower seeds, pepitas, or even chocolate chips. Don’t forget to enter my Green Mountain Coffee Giveaway while there’s still time! Peel, slice, deseed and chop squash into 1-2″ cubes. Toss in vegetable oil to coat lightly. Spread on a baking sheet and roast for 45 minutes. Allow to cool slightly, then toss into a food processor or blender and puree until there are no chunks. Should yield about 1 3/4 cups. Combine flour, baking powder, kosher salt, pumpkin pie spice and granulated sugar in a medium bowl. Use a whisk to combine and aerate well. In a large bowl, combine vegetable oil, eggs, squash puree, half and half (or milk) and vanilla. Whisk together until well combined. Eggs should be completely broken. Add dry ingredients to wet, stirring with a spoon until just combined. Add pecans and cranberries and stir again, but gently. Don’t overmix, or the muffins will be tough! Bake for 20-25 minutes. Mine took 22. This post contains an Amazon Affiliate link. If you click the link and then later purchase something from Amazon, Bluebonnets & Brownies may receive a few pennies. Butternut squash is one of my favorite things ever – I have got to try these! How did you know that my impulse buy butternut squash is giving me a dirty look from our countertop as I type?? I know where that baby is headed…into my muffins! Love this idea Amber. Haha, Erin. Been there, done that. Hope you enjoy them! Love the idea of squash in a muffin – I made sweet potato muffins a little while ago and I was really impressed with the texture. It’s opened a whole new world of muffin-baking! These look great, I love the combination of the pecans and cranberries. I still need to try that too, Kathryn! I’m in love with sweet potatoes this year. I always kind of liked them, but since we’ve been getting them regularly in our CSA box, TOTALLY in love. I totally adore these! Would never think squash –> muffin, but you rocked it! Truth be told, friend, I was just trying to avoid the obvious hash or soup! We’ve been eating a lot of roasted vegetables, and the night before I made these, we’d had a roasted hash with sweet potatoes, parsnips, purple carrots, and broccoli. I wasn’t feeling MORE roast vegetables, so why not puree, right? This is such a perfect change-up from pumpkin-everything right about now! I’ve always been more of a butternut fan myself. Love the idea of adding pepitas for a bit of nutty crunch. Ruthy, thanks so much for your sweet comment! I have to admit, I’m not normally a huge butternut fan, but fell head over heels for it in these muffins. Something about the addition of cranberries made them absolutely addicting. I think these sound great! I bet it’s no different from baking with pumpkin. Yum! Exactly right, Katrina! You could use butternut squash puree anywhere that you’d normally use pumpkin.